As I landed in the tumultuous city of Altamira last Thursday I was greeted with breaking news from my colleagues at the Xingu Alive Forever Movement: The massive Belo Monte work camp and Trans-Amazon highway had been closed in a daring early morning occupation led by a diverse coalition of indigenous peoples, local farmers, fisherfolk, and members of social movements from across Brazil. In a direct action that was unprecedented in its scale and impact, the occupiers paralyzed works on a portion of the monstrous Belo Monte Dam complex, sending a strong signal of resistance to a belligerent federal government determined to bulldoze their river and their rights. Meanwhile, construction of another set of the project’s work camps continued at breakneck speed, using a fleet of heavy machinery to carve wide roads through felled and burnt out forests, forcing people from their homes to make way for Belo Monte’s strategic installations. Quite the opposite of heeding the call of protesters to immediately halt construction, the project consortium NESA continued its destruction unabated, confident that overwhelming and seemingly impervious political support for Belo Monte – backed by a ruthless security apparatus – would protect their objectives. 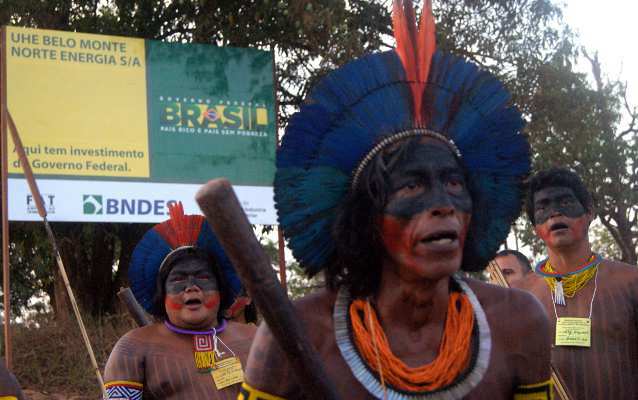 But the protest occupation laid bare a basic fact: resistance to the dam is growing as fast as its popularity among local communities and the Brazilian public is falling.